Connections. They are so important in motherhood. Amidst the craziness of sports-schedules, deployments, homework, TDYs/ TADs, simply fitting in baby's nap time some days, PCSing, drama, life. We, as military wives and moms, need to be connected. We need friends, family, folks to say "I'm there for you". Mom Connection, by Tracey Bianchi, is a great reminder of this fact. 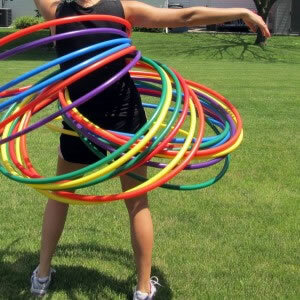 I love the image she paints of a mom and a hula hoop, many hula hoops actually; trying to balance herself, her children, her husband, her job, her friends, her needs, & wants. It is a tricky act, keeping all those hoops in sync. But it can be done and Tracey offers some great pointers. After a PCS how do you meet new friends? Have you ever sat on a park bench and simply "made a new friend"? Take your children to the park. Get out and enjoy your new surroundings and look for others that may also be seeking friendship. I can't tell you how many simple conversations I have struck up at a park bench. Where is your rhythm? Community, family, church, friendship. All people that can help you find your center. Your rhythm. Tracey talks a lot about rhythm, and fortunately she doesn't mean my dancing moves. Although turning up the music at 4pm and having a dance party is a great way to sync up the family's mental attitude, as Tracey suggests! Mom Connection is really what MOPS is all about. Community. Who are your friends? Where do you turn when you need to vent? How do you balance the needs of your immediate family and your military-family or extended-family? If these questions leave you raising your hand like, "Yes, I want to know more", I would find a copy of this book: Mom Connection: Creating Vibrant Relationships in the Midst of Motherhood . How has being a military-family influenced you as a mom? I will draw two random winners (so your answer doesn't need to be eloquent, just honest) on Friday, May 19th (which means I need a way to contact you if your name is drawn). Leave your email address in the comment or send it to me at leanne@militaryavenue.com.